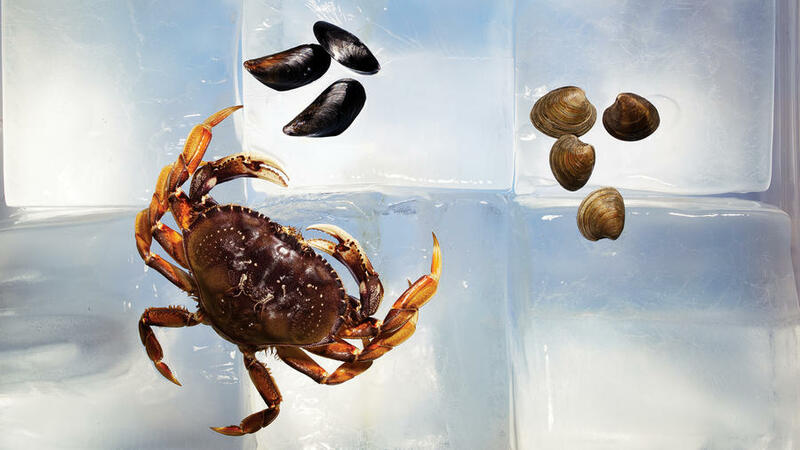 Clams, oysters, scallops, mussels are the ideal farmed seafood. In the wild, they may be harvested using hydraulic dredges, which rip up the ocean floor. Farming, on the other hand, involves either raising the mollusks on beaches and hand-raking to harvest, which has very little impact on the beach itself; or growing them on strings hanging from floating platforms or in metal-mesh sacks laid on floating racks, neither of which does any environmental damage whatsoever. Either, as long as you buy American (check the label on the package or the sign at the fish counter). Farm-raised shrimp and prawns from Asia and Latin America ― representing the vast majority of the shrimp we eat ― are often raised in badly managed, heavily polluted saltwater ponds that destroy the coast, including native mangrove forests, and spread disease. Wild shrimp are caught without regard to the turtles and other fish that get snared in the nets. In the States, production standards are the highest in the world, and wild shrimp are caught in clean waters, with the conscientious use of bycatch-excluding devices. These fish are great choices from a sustainability point of view because they eat mostly grain, not other fish. And they can be raised in ponds and tanks inland, with low chance of spreading disease or pollution to wild stocks. Pollution is well managed, plus the fish grow fast. Buy U.S. fish; Chinese-raised fish can have pollution problems. These fish are a good choice when raised in tanks, ponds, and “raceways” (fast-moving channeled river water) that are recirculated and not open to the sea. They don’t pollute or spread disease into the ocean, and because some, such as rainbow trout, feed on grain mixed into fishmeal, they don’t deplete wild fish populations as much as larger fish such as sturgeon do. These predators are usually raised in the open ocean, in net pens. What seemed like a great idea initially has now revealed itself to be one in serious need of fixing: The farmed fish pollute the water with their concentrated wastes, spread disease (the crowded conditions make them prone to it, which requires dosing with antibiotics), and escaped fish compete for food with the wild fish. All of these problems are being tackled with varying degrees of success by the aquaculture industry, and a few have come remarkably far. The one major hurdle remaining is the fact that these fish must be fed lots and lots of other, smaller fish (anchovies, sardines, etc. ), depleting those resources for wild stocks. Bluefin are an entirely separate, troubling category of farmed fish. They eat extraordinary amounts of wild fish (36 pounds of wild fish to 1 pound of tuna), and their ocean-crossing, fast-moving, solitary nature makes them unhappy in any kind of captivity. Furthermore, they are exceptionally difficult to breed in captivity ― you’ll never see truly farmed bluefin in a market―and most of the “farmed” bluefin at market involves catching juveniles and raising them to maturity, which may have a devastating effect on an already strained population. Focus on salmon: Which is better, farmed salmon or wild?